Jeff Koons has made a career testing the boundaries between the hoighty-toighty world of fine art and kitsch popular culture that caters to the masses. And nothing makes the masses happier than puppies and flowers!! This giant (forty foot tall) terrier is made of stainless steel and filled with live flowers. Though they are contained by the steel cage, they are still beautifully blooming. How sweet. The museum website touts the juxtaposition of references to rich people hobbies like English gardens and dog breeding and stuff poor people enjoy like chia pets and greeting cards. 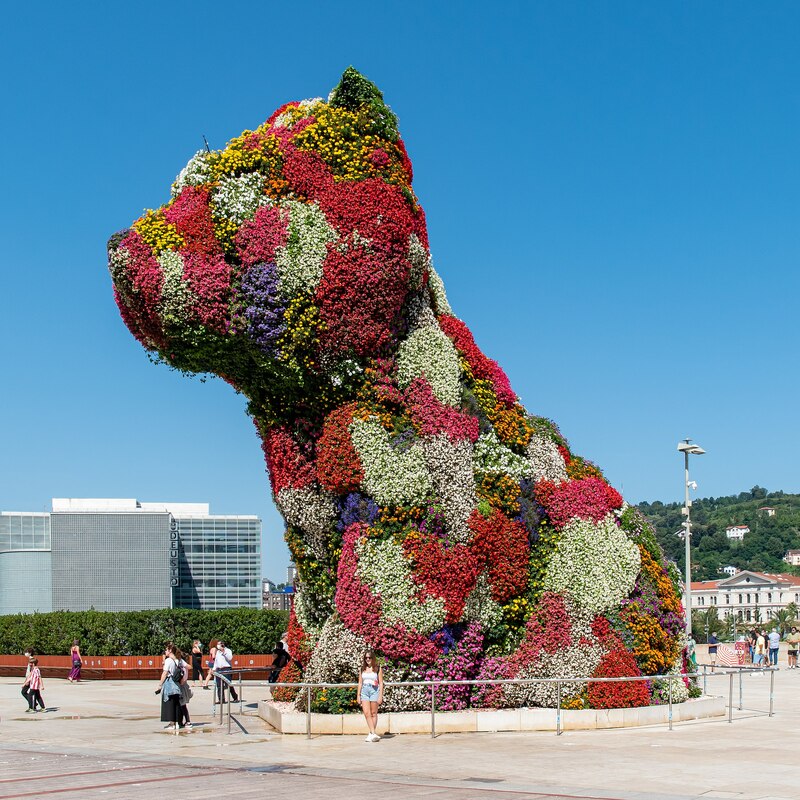 It stands “guard” over the Guggenheim in Bilbao and probably smells great too. Like a lot of Koons work, it’s not particularly challenging, but I’m sure it gives visitors a chuckle. I think people like it because it’s cute. Well, not all people. Three members of the Basque nationalist terrorist organization called the Euskadi Ta Askatasuna (ETA) disguised themselves as gardeners and tried to plant flower pots filled with grenades near the sculpture in time for the inauguration of the museum which would be attended by the King and Queen of Spain. Pardon that plant pun, because it really is no laughing matter. One of the two policemen who foiled their plan was shot and killed in the attack, which really puts a damper on the whole happy puppies and flowers thing. The square in which the sculpture stands is now named after the fallen officer.